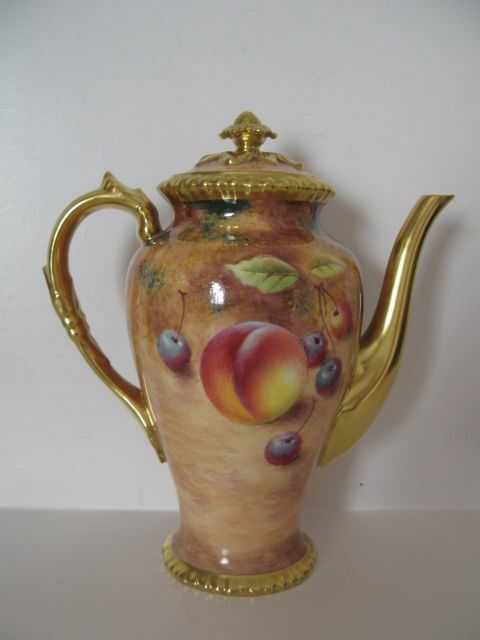 A Royal Worcester Fruit Painted Coffee Pot By Roberts. 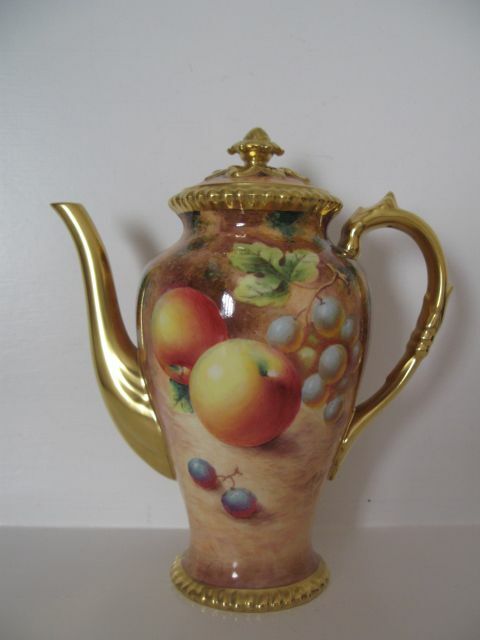 A stylish, gadrooned edge Royal Worcester porcelain coffee pot and cover with painted fruit decoration by William Roberts. 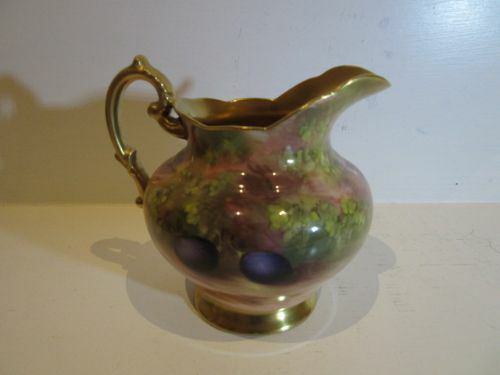 Standing approximately 7.3/4" overall height x 6.1/2" maximum width, it has the black factory stamp for circa 1975 and is in pristine condition with no damage, crazing or restoration, and the gilding is bright and without wear. A Royal Worcester Fruit Painted Cream Jug By Edward Townsend. 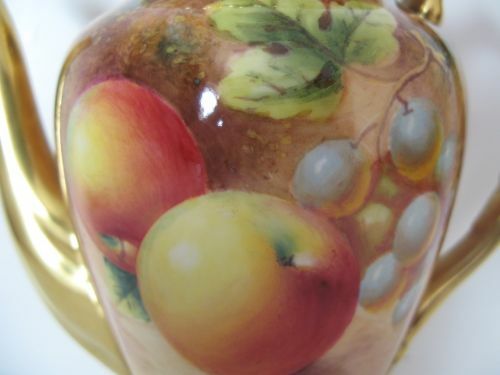 A Royal Worcester porcelain cream jug, with well painted fruit decoration by Edward Townsend. 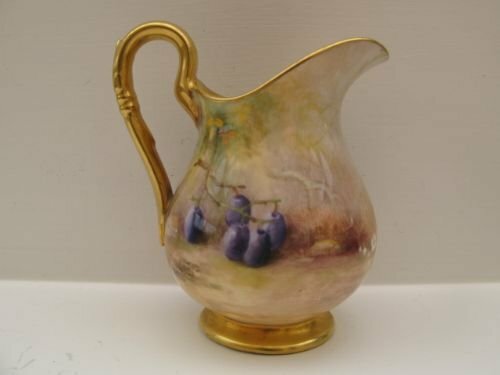 Standing approximately 4"high x 3.3/4"wide over the handle, it has the puce factory stamp for circa 1922 and is in excellent condition with no damage, crazing or restoration, and the gilding is fresh and unworn. 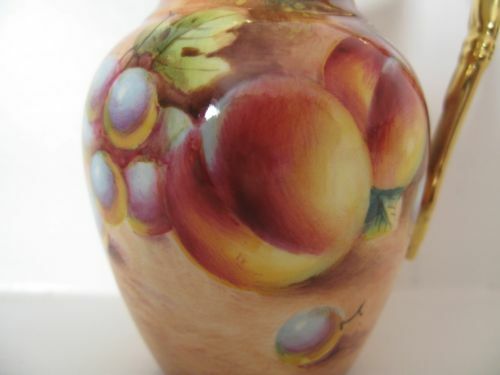 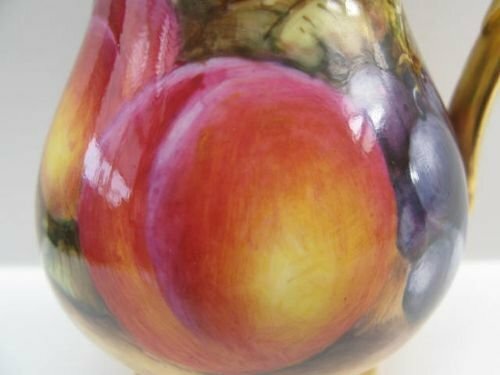 A Royal Worcester Fruit Painted Cream Jug By H Ayrton. 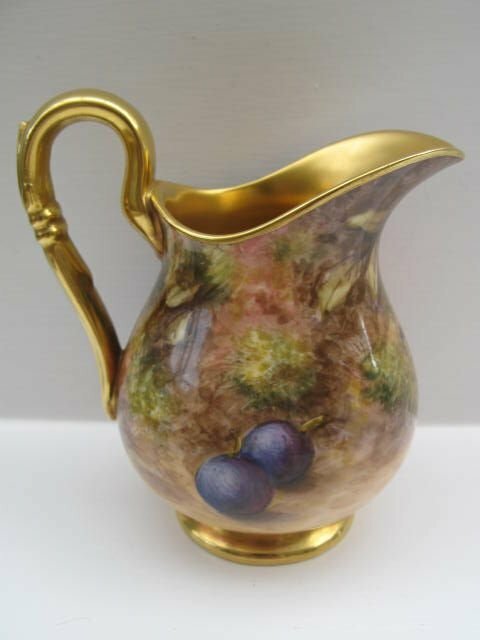 A good sized Royal Worcester porcelain cream jug, with well painted plums and black grapes against a mossy background by Harry Ayrton. 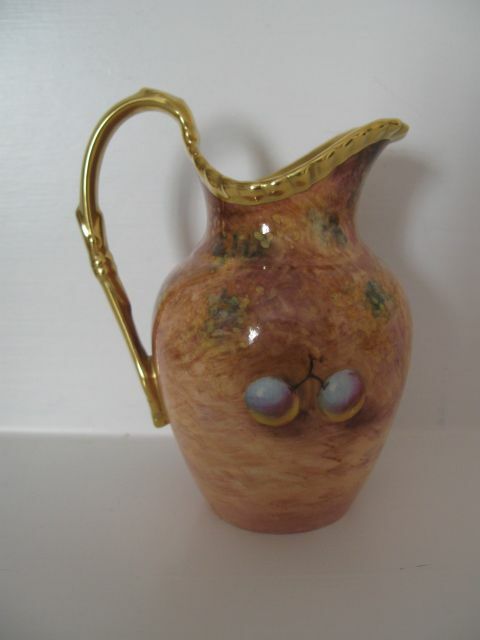 Standing approximately 4.1/4"tall x 4.1/4"wide over the handle, it has the puce factory stamp for 1933 and is in excellent condition with no damage, crazing or restoration and the gilding is bright and without wear. 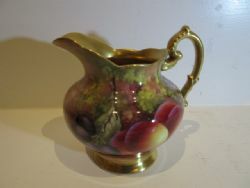 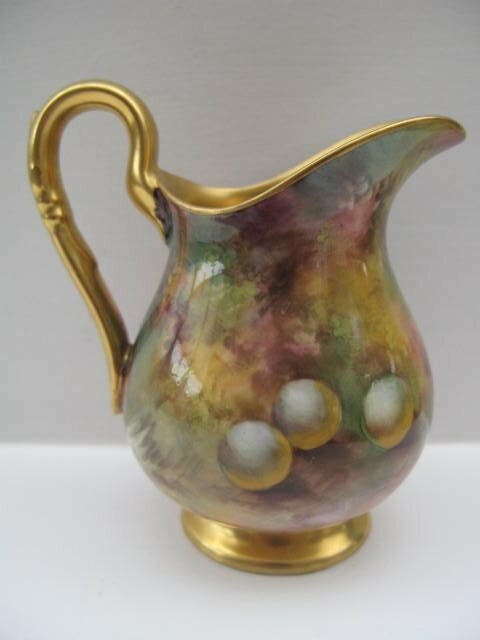 A Royal Worcester Fruit Painted Cream Jug By J. Freeman. 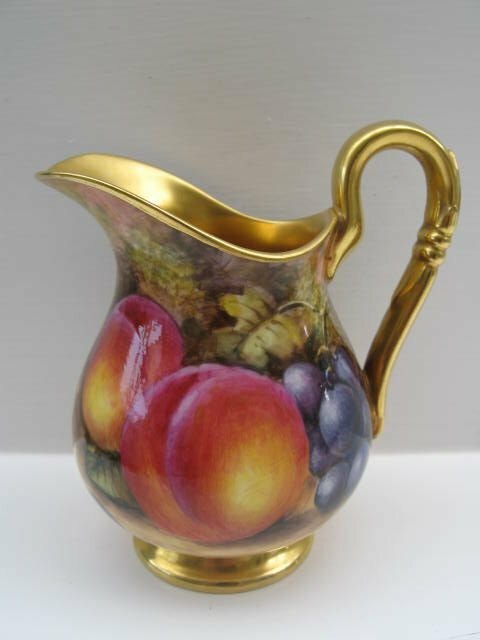 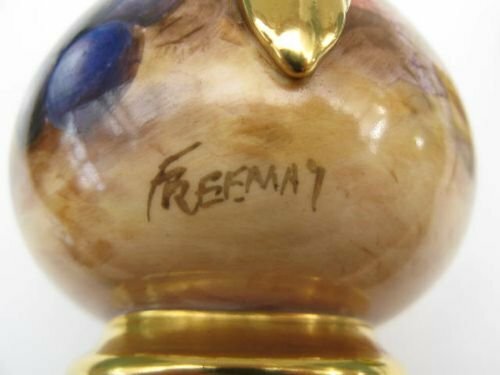 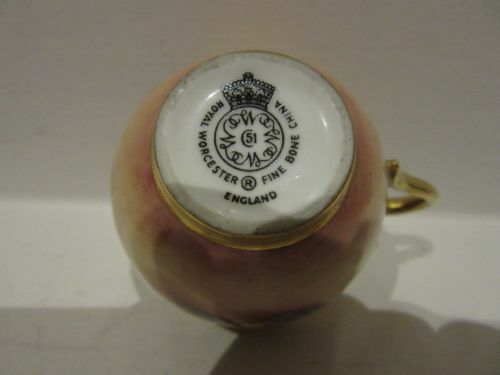 A good, Royal Worcester cream jug, with well painted fruit decoration by John Freeman.It stands approximately 4.1/8" tall x 2.3/4" body diameter with the black factory stamp for 1959, and is in fine condition, looking as though it has spent all its life in a display cabinet. 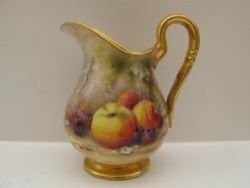 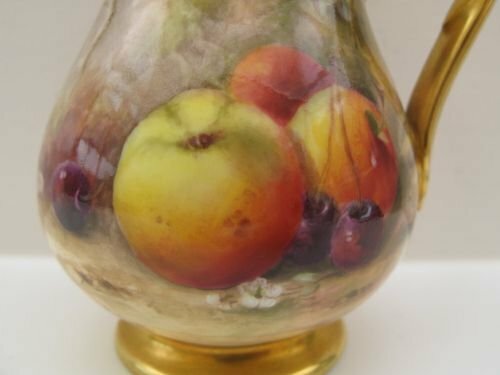 A Royal Worcester Fruit Painted Cream Jug By J. Smith. 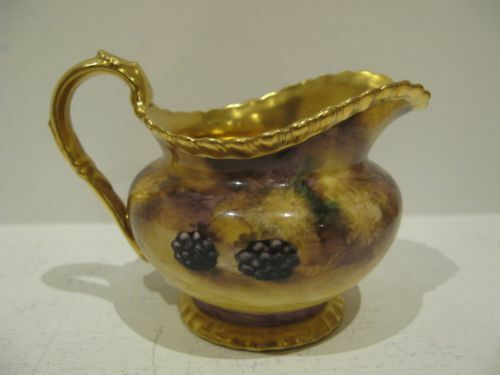 A good Royal Worcester porcelain cream jug, with heavily gilded rope-twist edge and well painted fruit decoration by John Smith. 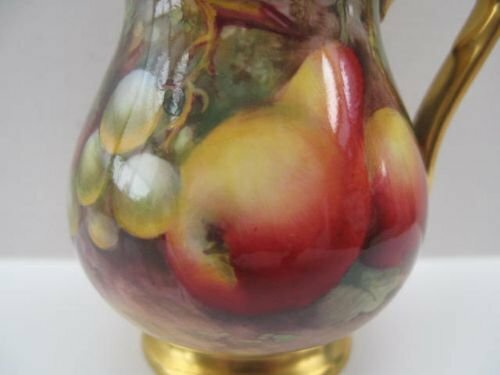 Measuring approximately 5.1/4"overall length x 3.3/4"tall, it has the black factory stamp for circa 1970 and is in excellent condition with no damage, crazing or restoration and the gilding is bright and virtually without wear. 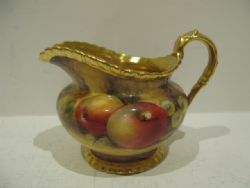 A Royal Worcester Fruit Painted Cream Jug By Ricketts. 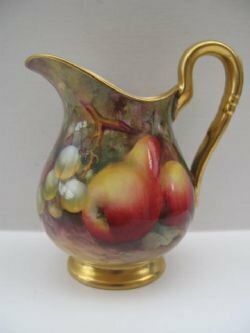 A Royal Worcester porcelain cream jug, with wonderfully painted fruit decoration, again unmistakably by the very talented William Ricketts. 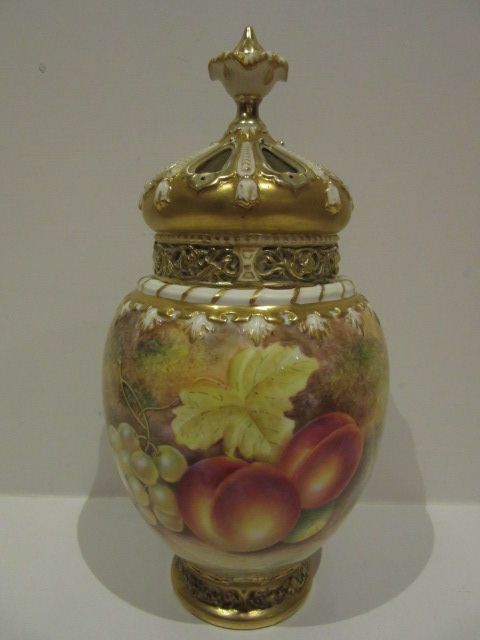 Standing approximately 4"tall x 3.1/2"overall width, it has the puce factory stamp for 1919 and is in excellent condition with no damage, crazing or restoration, and the gilding is totally unworn. 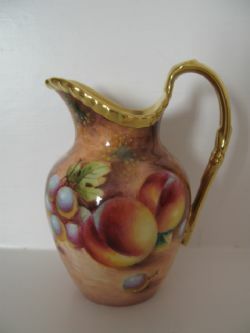 A Royal Worcester Fruit Painted Cream Jug By Roberts. 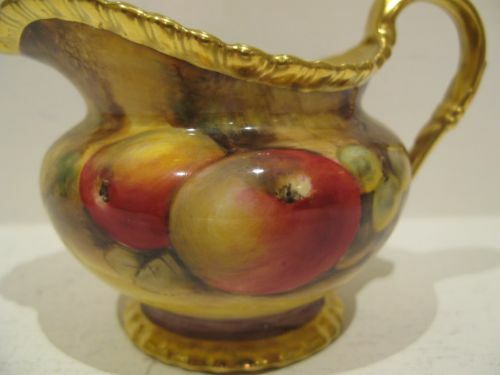 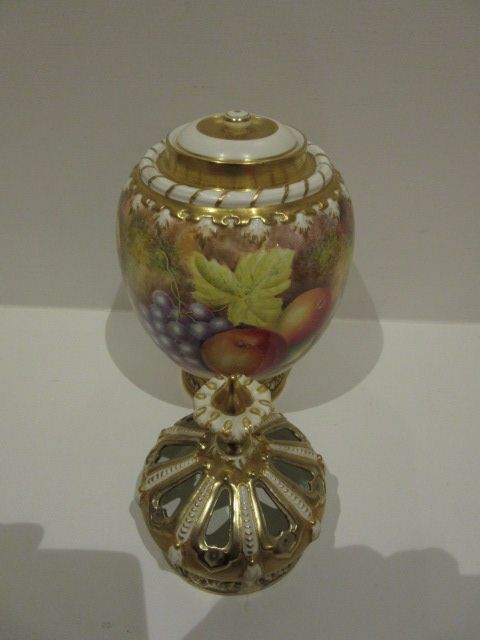 A Royal Worcester porcelain cream jug, with gadrooned rim and painted fruit deecoration by William Roberts. 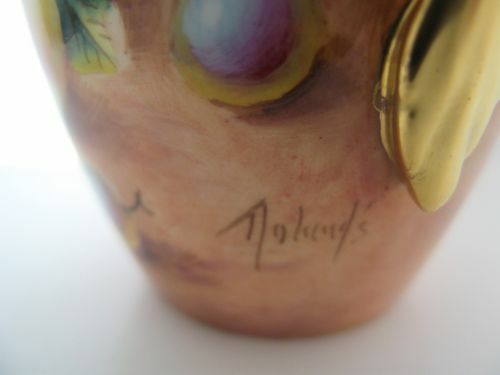 Standing approximately 4"tall x 3.1/4"overall width and with the black factory stamp for circa 1975, it is in excellent condition with no damage, crazing or restoration and the gilding is bright and without wear or rubbing. 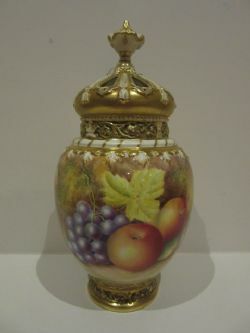 A Royal Worcester Fruit Painted Crown Top Pot Pourri By B. Leaman, Circa 1975. 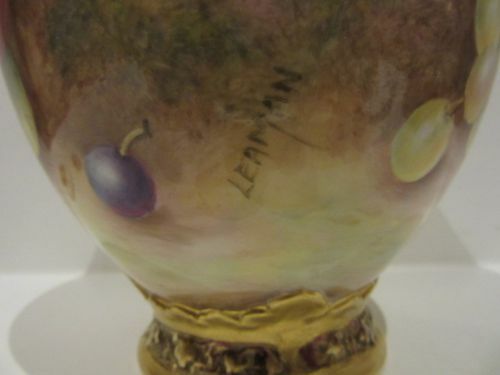 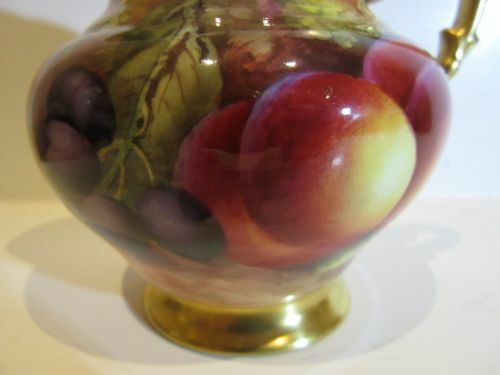 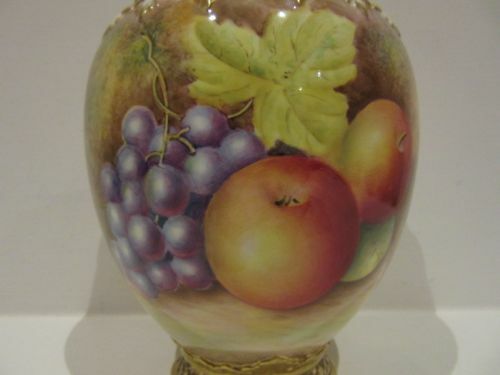 A good Royal Worcester "crown top" porcelain pot pourri complete with inner and outer lids, shape number 2048 small size, with all round painted apples, black grapes, green grapes and plums against a mossy background by Brian Leaman. 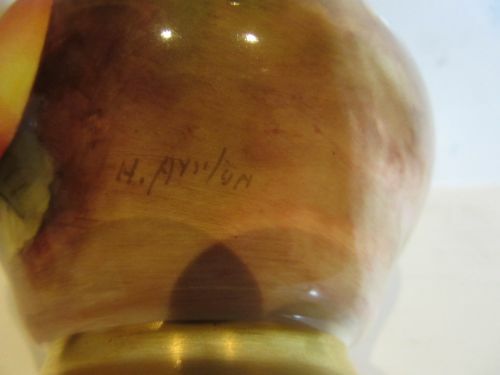 Standing approximately 9.1/2"overall height x 4.3/4" diameter, it has the black factory stamp for circa 1975 and is in excellent condition with no damage, crazing or restoration and the gilding is bright and virtually without wear. 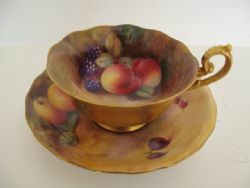 A Royal Worcester Fruit Painted Cup And Saucer By Bee And Ayrton. 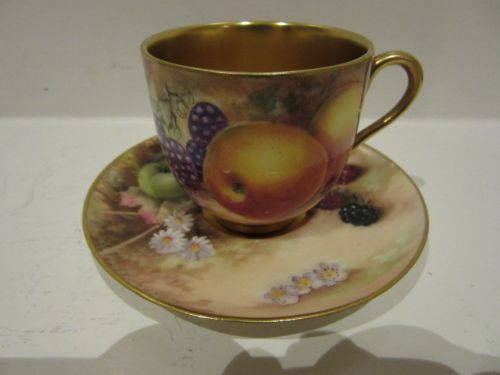 A good Royal Worcester porcelain teacup and saucer, with very well painted fruit decoration by William Bee for the cup and Harry Ayrton for the saucer. 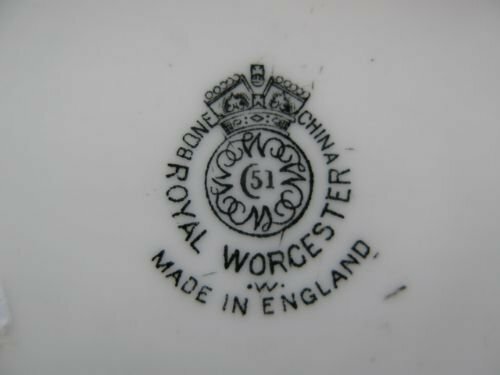 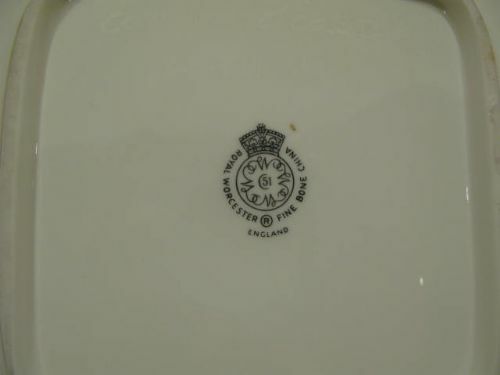 The cup measures approximately 5"wide over the handle x 2.1/4"tall and the saucer 5.1/2"diameter with both having the puce factory stamp for 1932. 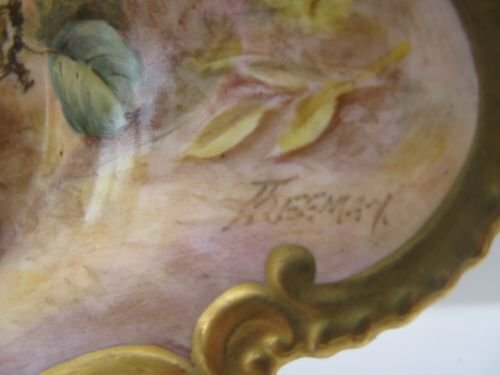 They are in very good condition with no damage, crazing or restoration and the gilding is bright and without wear with only the usual fine scratching in the well of the saucer where the cup sits. 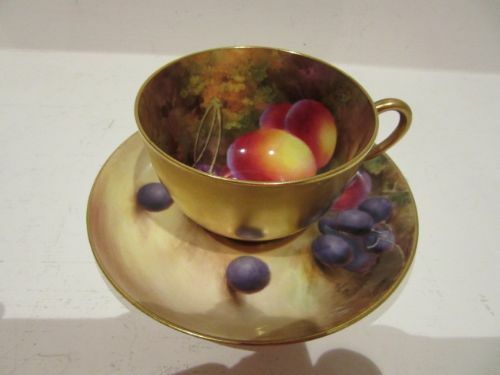 A Royal Worcester Fruit Painted Cup And Saucer By H. Ayrton And E. Townsend. A generously sized Royal Worcester porcelain cup and saucer, with well painted fruit by Harry Ayrton and Edward Townsend. 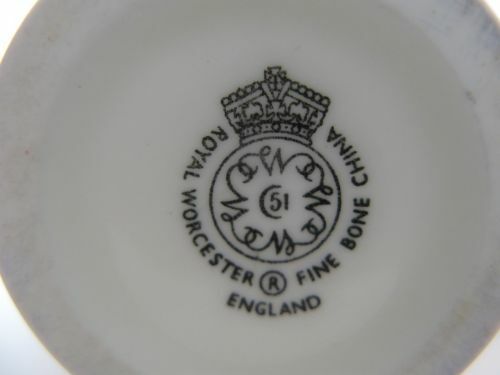 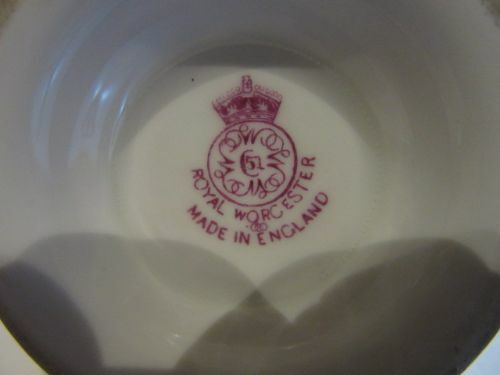 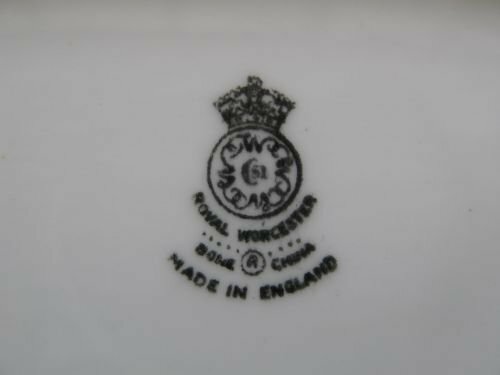 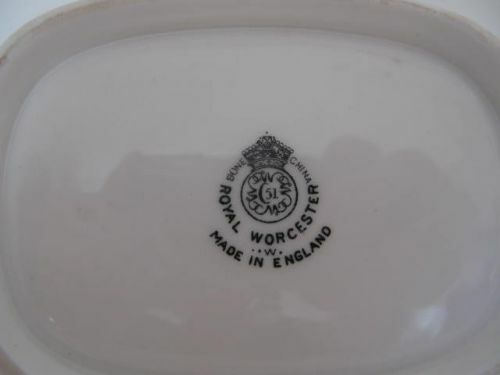 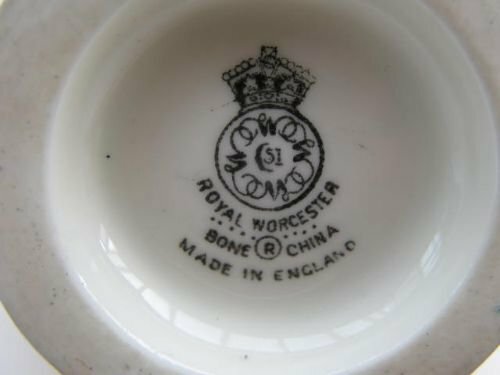 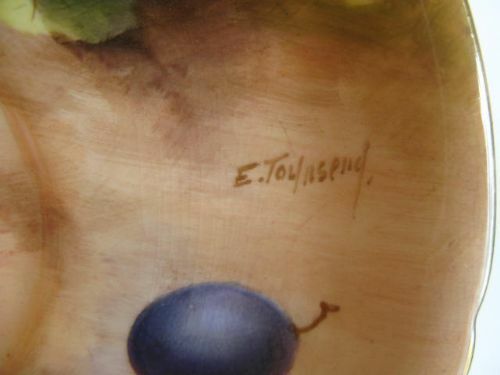 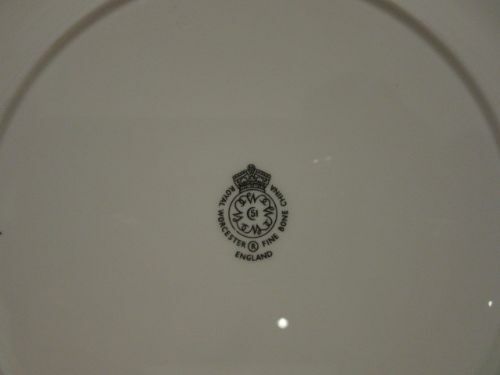 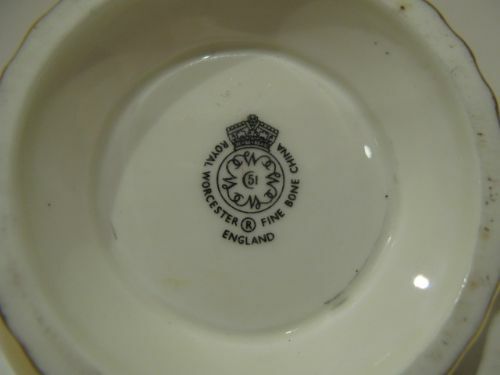 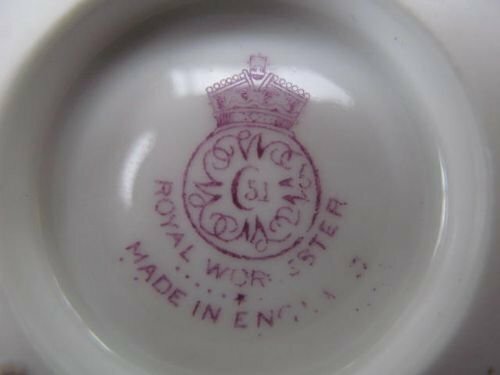 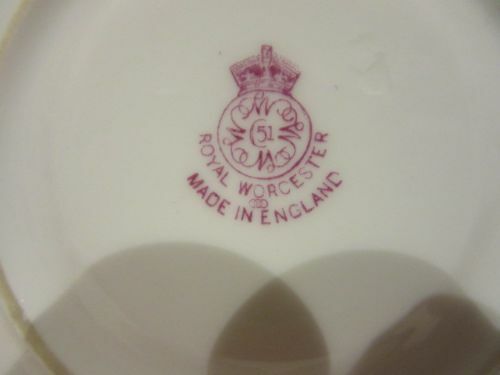 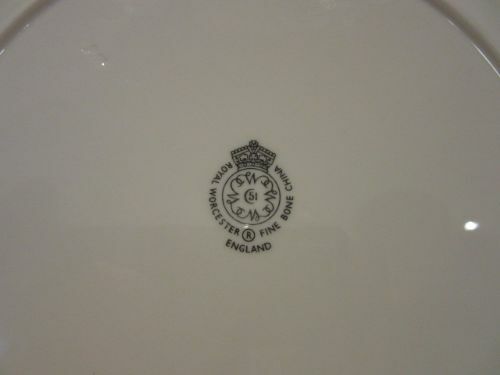 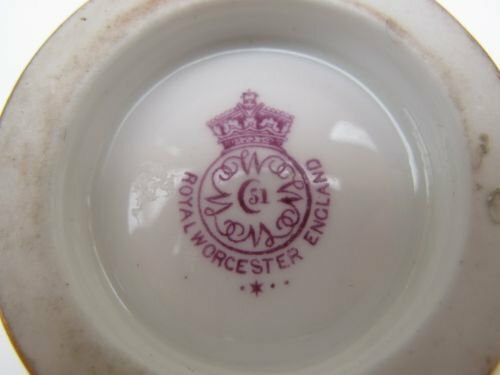 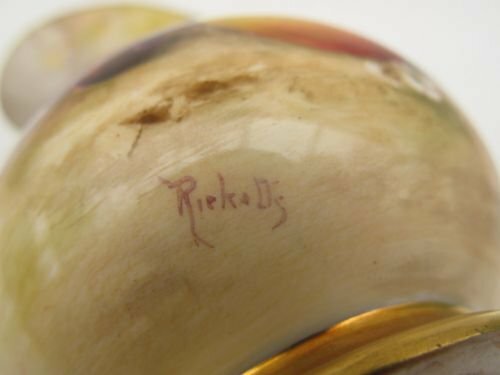 The cup measuring approximately 3"high x 4.7/8"wide over the handle has the puce factory stamp for 1933 and is by Harry Ayrton, the saucer is 5.3/4"diameter, has the puce factory stamp for 1933 also and is signed by Edward Townsend. They are both in excellent condition with no damage, crazing or restoration and the gilding is fresh and without wear. 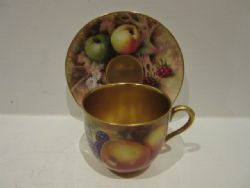 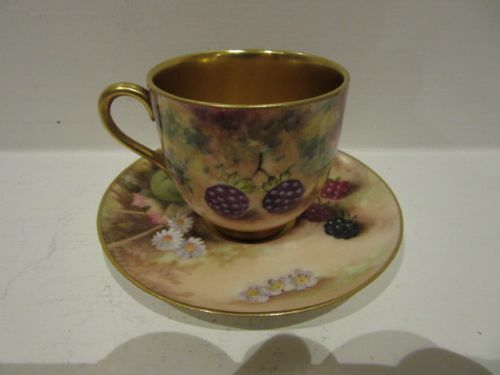 A Royal Worcester Fruit Painted Cup And Saucer By H. Price And G. Moseley. 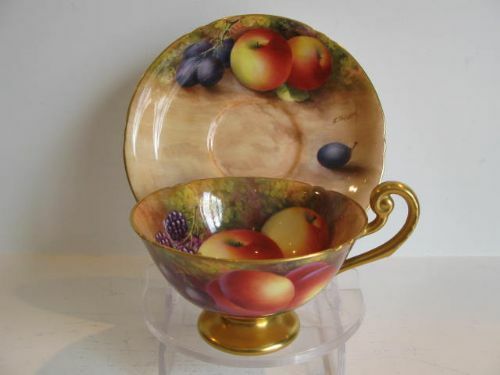 A nicely shaped, Royal Worcester porcelain cup and saucer with well painted fruit decoration, the cup by George Moseley and the saucer by Horace Price. 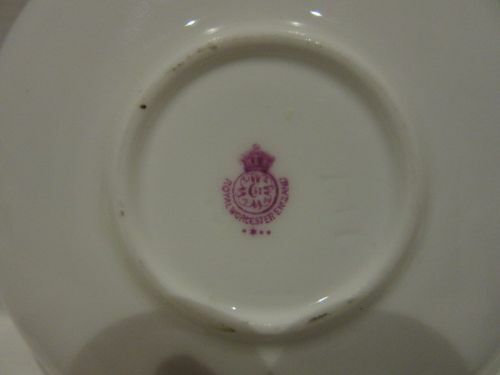 The cup stands approximately 4"diameter excluding the handle x 2.5/8"high, the saucer being 5.5/8"diameter x 1"deep, and both have the puce factory stamp for 1930. 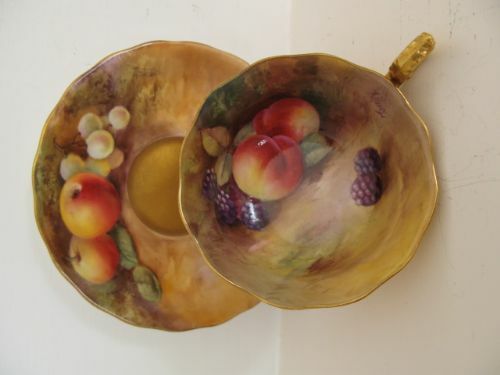 They are both in very good condition with no damage, crazing or restoration, and apart from a little wear in the well of the saucer where the cup sits, the gilding is fresh and clean. A Royal Worcester Fruit Painted Demitasse Cup And Saucer By W. Hart And Tomson. A Royal Worcester porcelain matched demitasse cup and saucer, with painted fruit decoration by Tomson and William Hart. 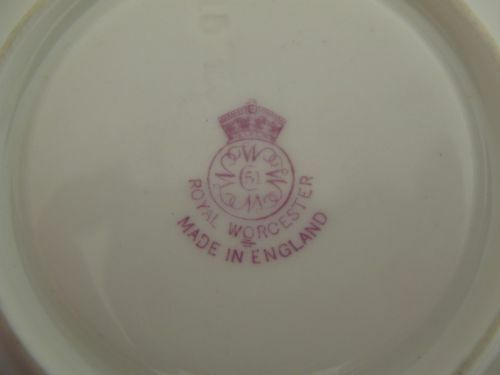 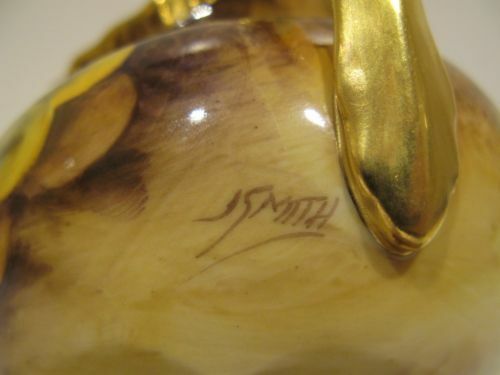 The cup signed by Tomson measures approximately 2.1/8"diameter x 2"high with the black factory stamp for circa 1980, and the saucer signed by Hart measures 3.7/8"diameter x 3/8"deep, and has the puce factory stamp for 1929. 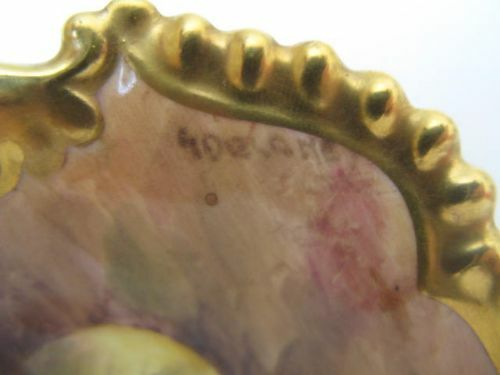 They are in good condition with no damage, crazing or restoration and the gilding shows very few signs of wear. 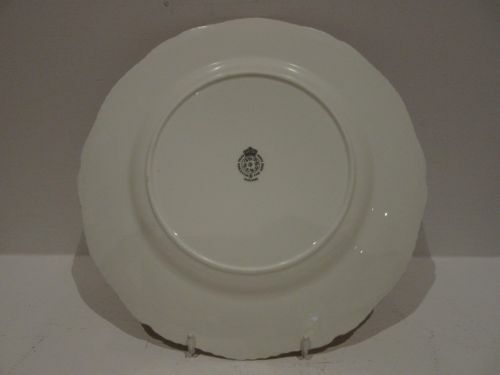 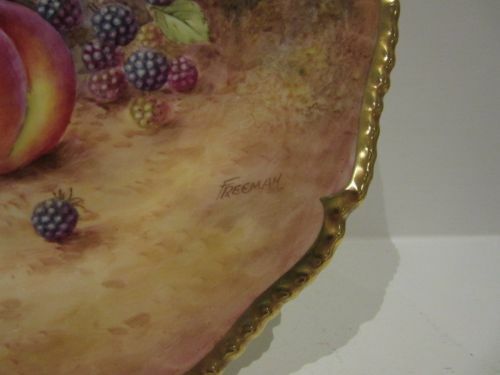 A Royal Worcester Fruit Painted Dinner/Cabinet Plate By Freeman. 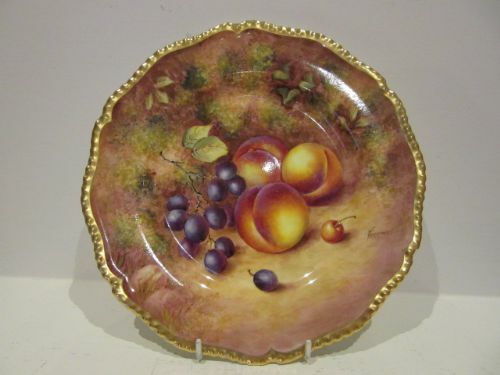 A good, Royal Worcester porcelain dinner/cabinet plate with heavily gilded and shaped gadrooned rim, and well painted fruit decoration by John Freeman. 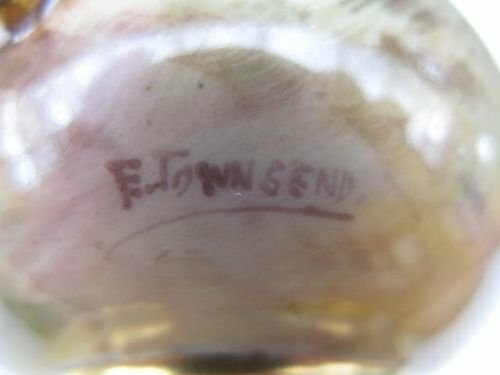 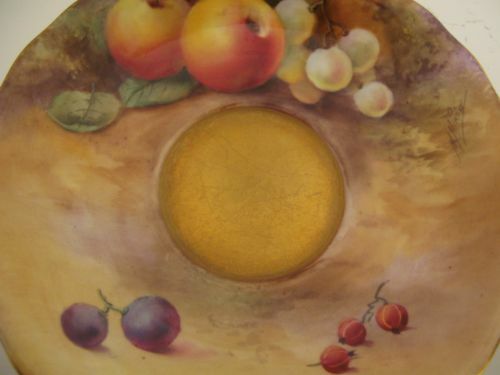 Measuring approximately 10.5/8"diameter x 7/8"deep, it has the black factory stamp for circa 1970 and is in excellent condition with no damage, crazing, scratches or restoration and the gilding is bright and virtually without wear. 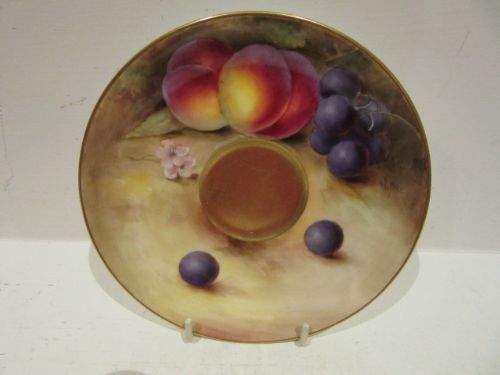 A Royal Worcester Fruit Painted Dinner/Cabinet Plate By H. Ayrton. A good, Royal Worcester porcelain dinner/cabinet plate, with heavily gilded shaped and gadrooned rim, and well painted fruit decoration by Harry Ayrton. 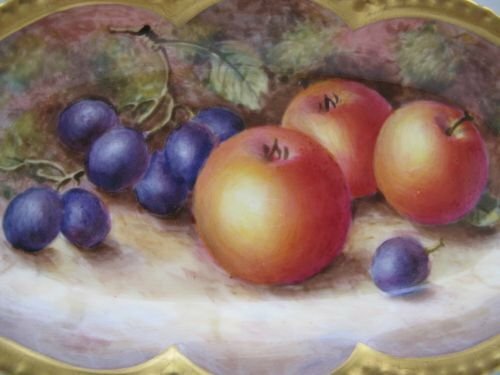 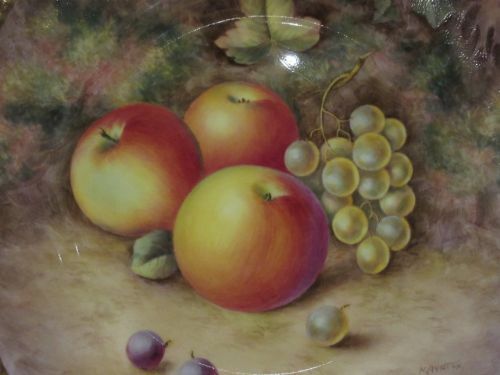 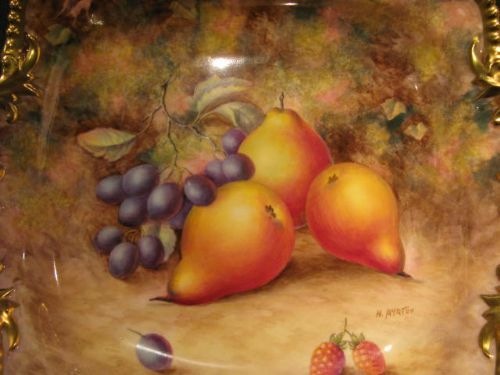 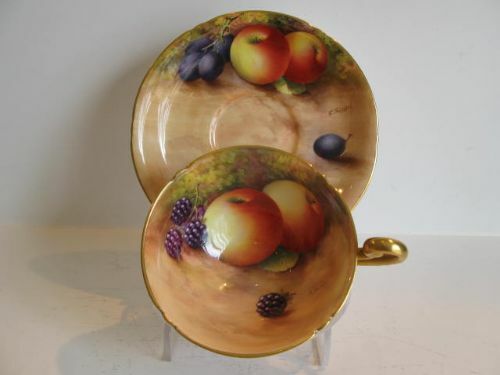 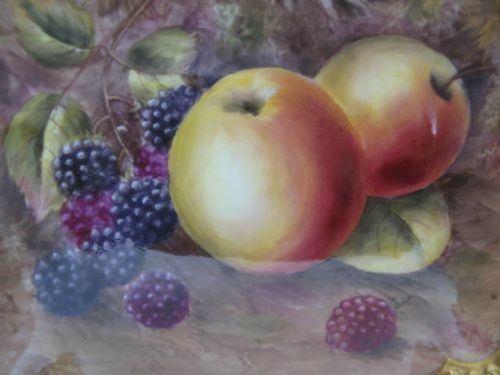 A Royal Worcester Fruit Painted Dinner/Cabinet Plate By J. Freeman. A good, Royal Worcester porcelain dinner/cabinet plate with heavily gilded, shaped and gadrooned border, and with well painted fruit decoration by John Freeman. 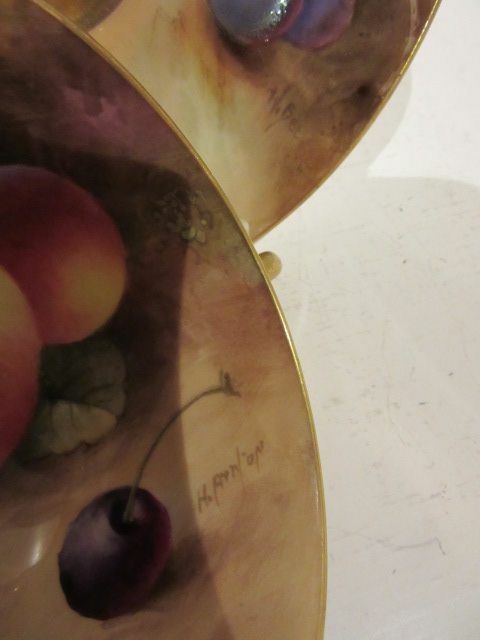 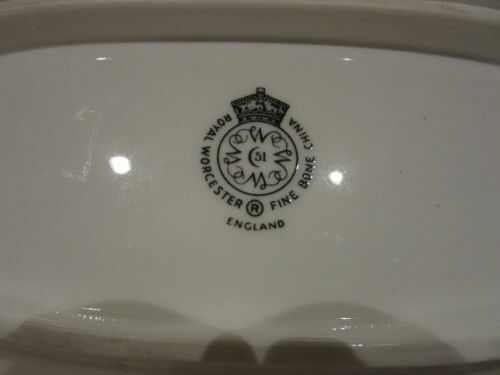 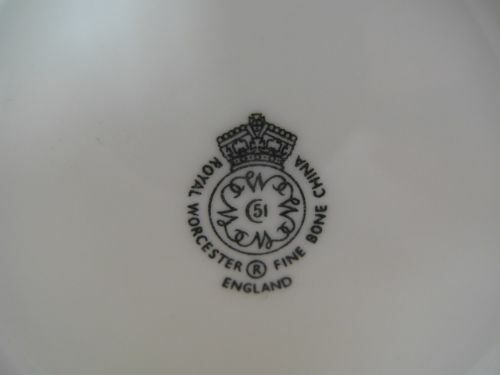 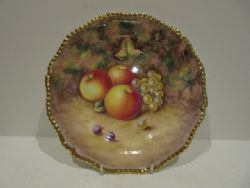 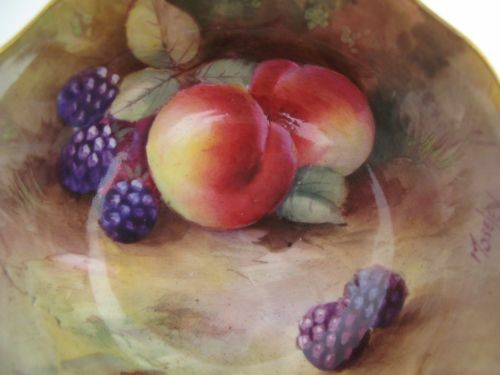 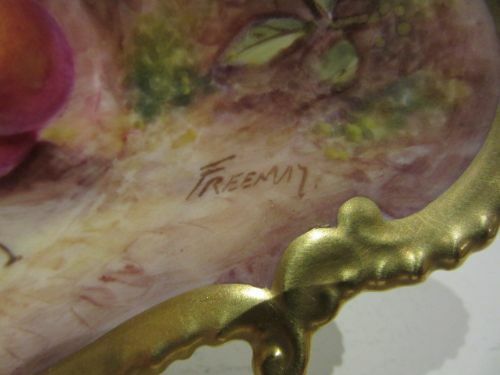 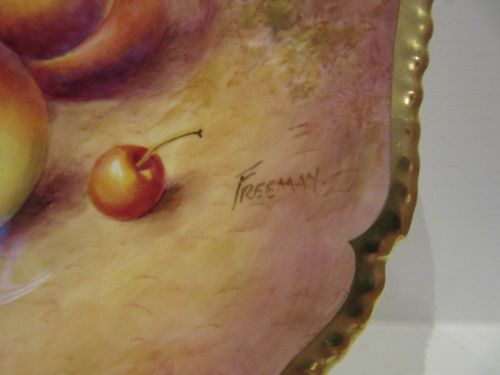 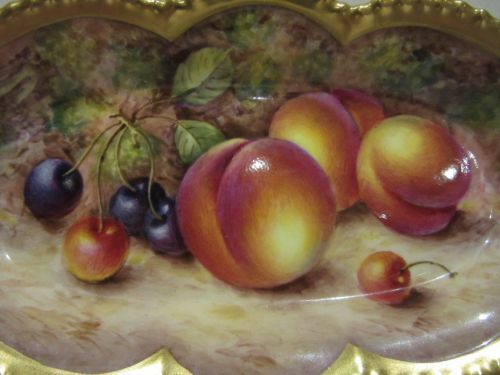 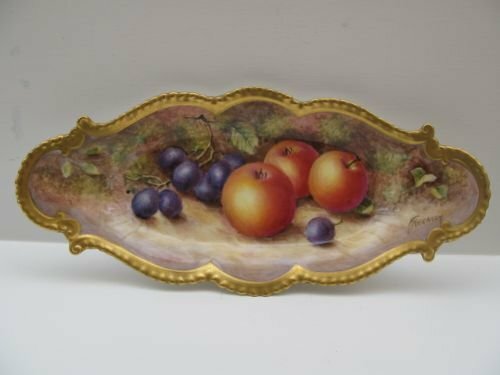 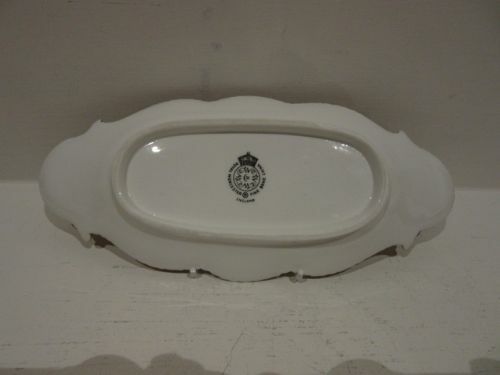 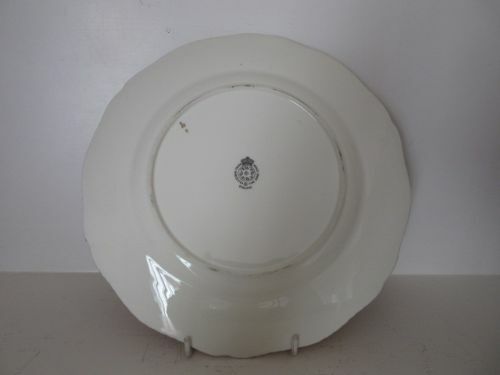 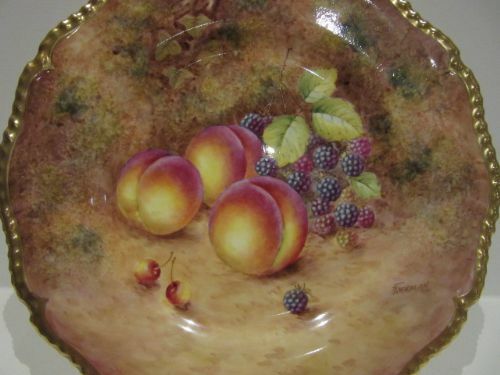 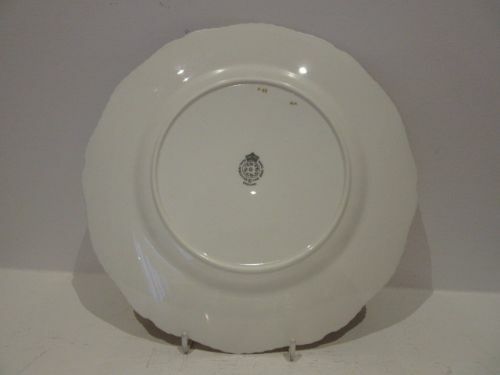 A Royal Worcester Fruit Painted Dish By Freeman. 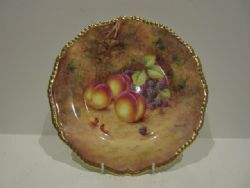 An attractive Royal Worcester porcelain dish, with shaped and heavily gilded gadrooned rim, decorated with well painted plums and black and red cherries against a mossy background by John Freeman. 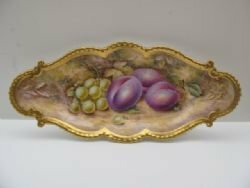 Measuring approximately 10"long x 4.1/4"wide x 1.1/2"deep, it has the black factory stamp for circa 1965/1970 and is in excellent condition with no damage, crazing or restoration and the gilding is bright and virtually without wear. 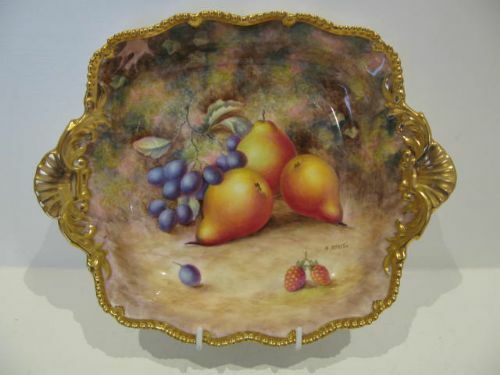 A Royal Worcester porcelain dish, with heavily gilded shaped border and fruit painted decoration by John Freeman. 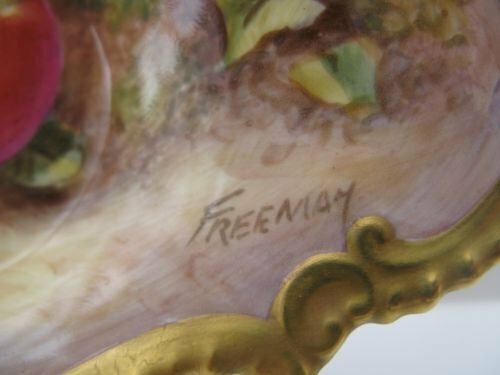 Standing approximately 10"long x 4.1/2"wide x 1.1/2"deep and with the black factory stamp for 1952, it is in excellent condition with no damage, crazing or restoration, and the gilding is fresh and unworn. 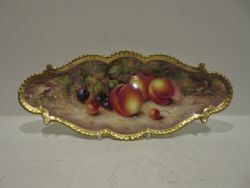 A good, Royal Worcester porcelain cabinet dish with heavily gilded shaped border, and well painted fruit decoration by John Freeman. 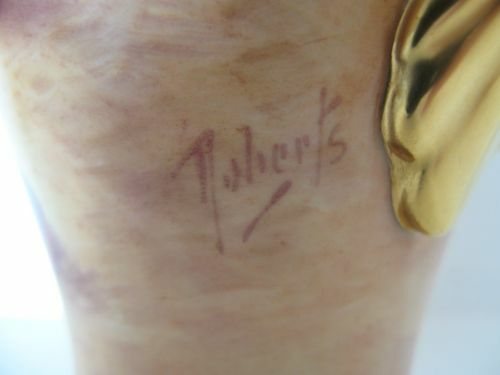 Standing approximately 10"long x 4.3/8"wide x 1.3/8"deep and with the black factory stamp for 1959, it is in excellent condition with no damage, crazing or restoration, and the gilding showing only the slightest signs of wear. 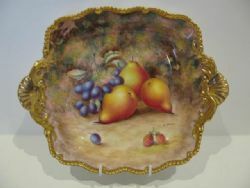 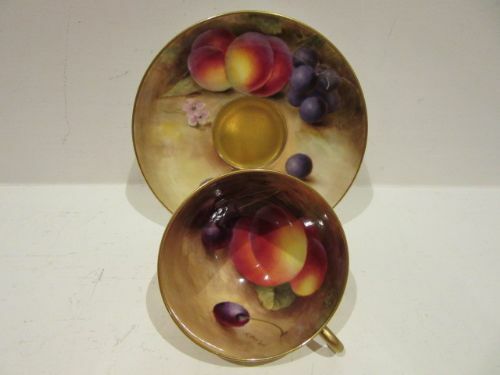 A Royal Worcester Fruit Painted Dish By G Delaney. An attractive Royal Worcester porcelain dish with heavily gilded rope-twist rim, and well painted fruit decoration by Gerald Delaney. 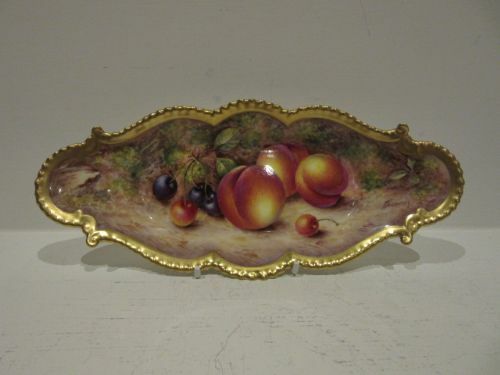 Standing approximately 7"long x 5"wide, it has the black factory stamp for 1953 and is in excellent condition with no damage, crazing or restoration, and the gilding is bright and without wear. 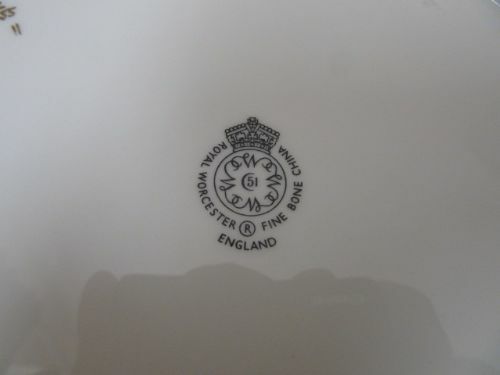 Any white marks or greyish areas are reflections only. 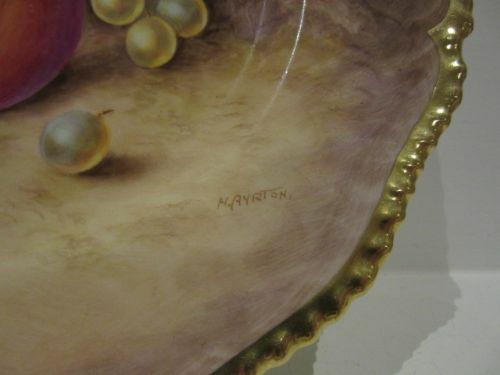 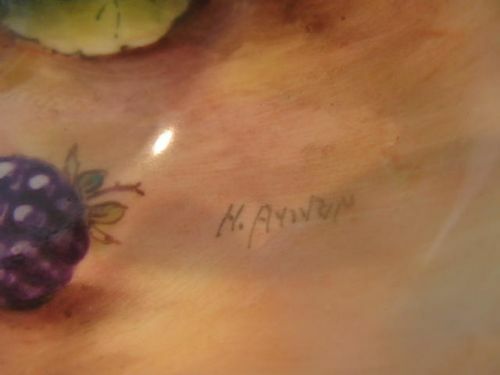 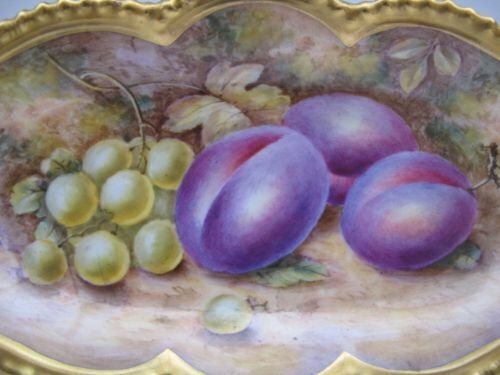 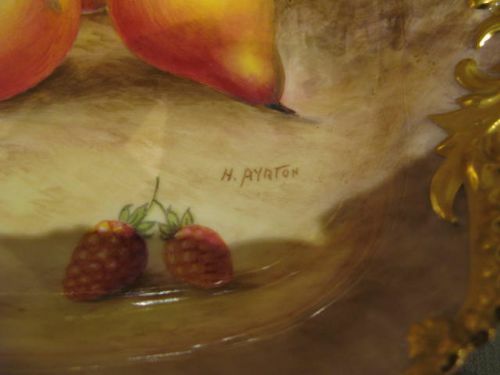 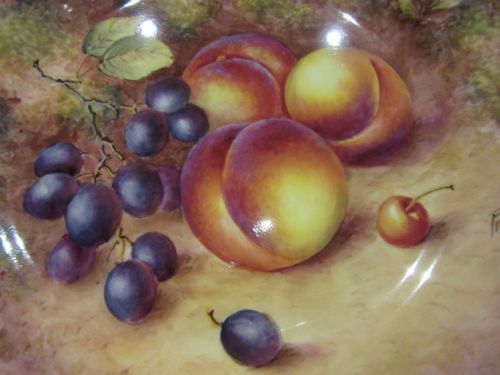 A Royal Worcester Fruit Painted Dish By H Ayrton. 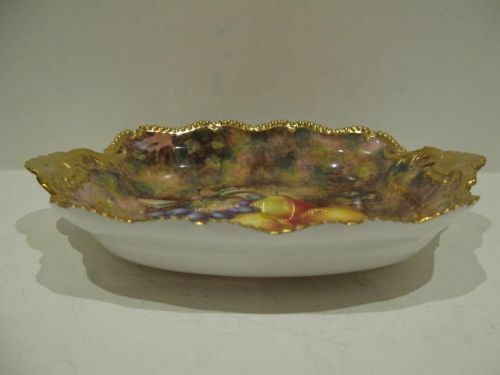 An excellent Royal Worcester porcelain "Tudor" dish with heavily gilded gadrooned rim, shell handles and well painted fruit decoration by Harry Ayrton. 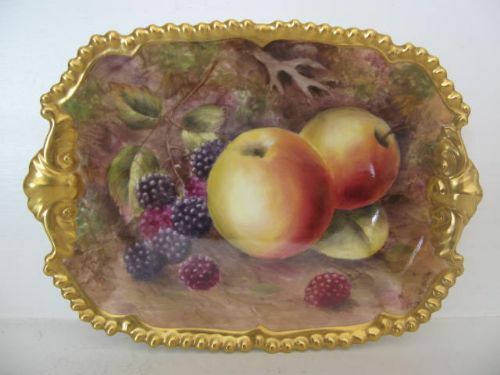 Measuring approximately 11.1/4"long x 8.3/4"wide x 2"deep, it has the black factory stamp for circa 1970 and is in excellent condition with no damage, crazing or restoration and the gilding is bright and without wear.